Looking for some thoughtful gift ideas for babies? Here’s my list of the best non-toxic gifts for babies! Whether it’s for a birthday present, for the holidays, or just because, it can actually be hard know what to buy for a baby. A lot of times we buy toys for our kids, only to have them prefer to play with kitchen utensils instead. Or maybe you’ve been overwhelmed by the great toy options out there, only to find that every single thing your baby likes to play with is made with PVC or other toxic materials. That’s why I’ve put together this list of non-toxic gift ideas for babies. These are tried and true toys that have been a hit with babies. And, they’re made from safer materials. So you shouldn’t find any BPA, PVC, or phthalates in these items. And any cotton used will be GOTS-certified. These recommendations are suitable for babies 0-18 months. Plus, while a whopping 80% of toys are made in China, many of these are not. Please note that it was impossible to put together a useful list of good toys and avoid China altogether. So you’ll find toys listed below are made in China, including some that are made by responsible companies that own their own factories in China. I’ve carefully selected these items not only because of their quality but also because they are sure to make any baby squeal with delight. I hope these non-toxic gift ideas provide your sweet baby lots of joy, too! 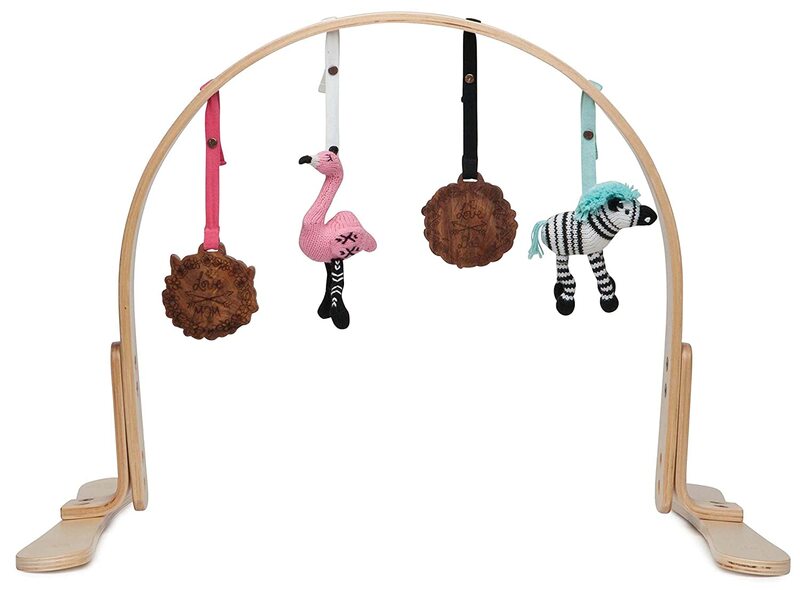 Every baby should have this amazing wooden drum! We never get tired of ours. 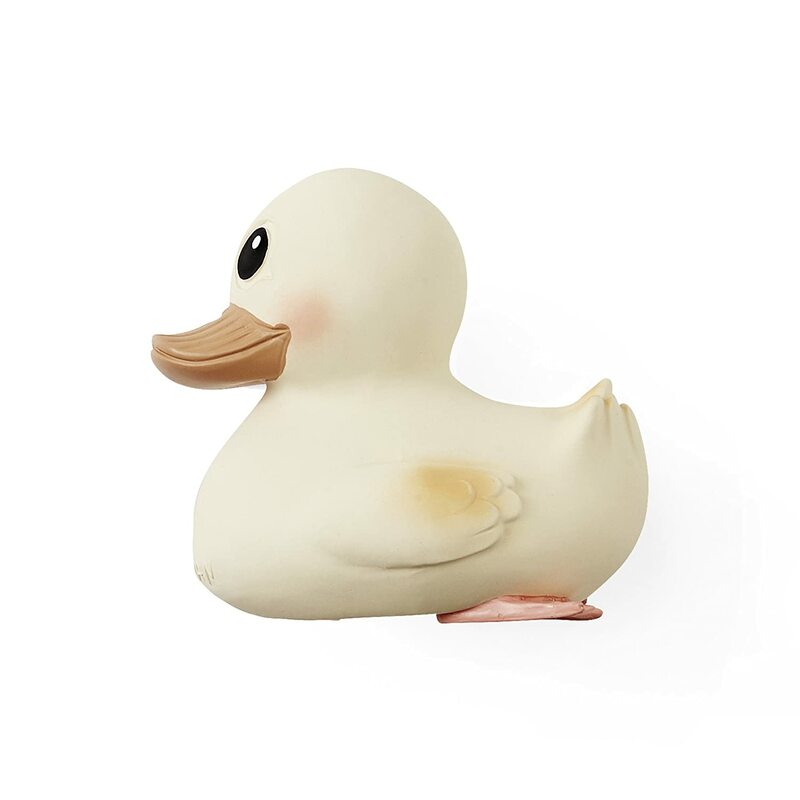 This natural rubber duck is beautiful and really well made. It’s also hermetically sealed, so you don’t need to worry about mold. We love ours, and use it as a bath toy. This duckie is so soft it could be played with at any age. Clutching toys are great for younger babies who are working on their grasp and/or who are teething. They’re also just really fun to hold. This is a great gift for 0-9 months. 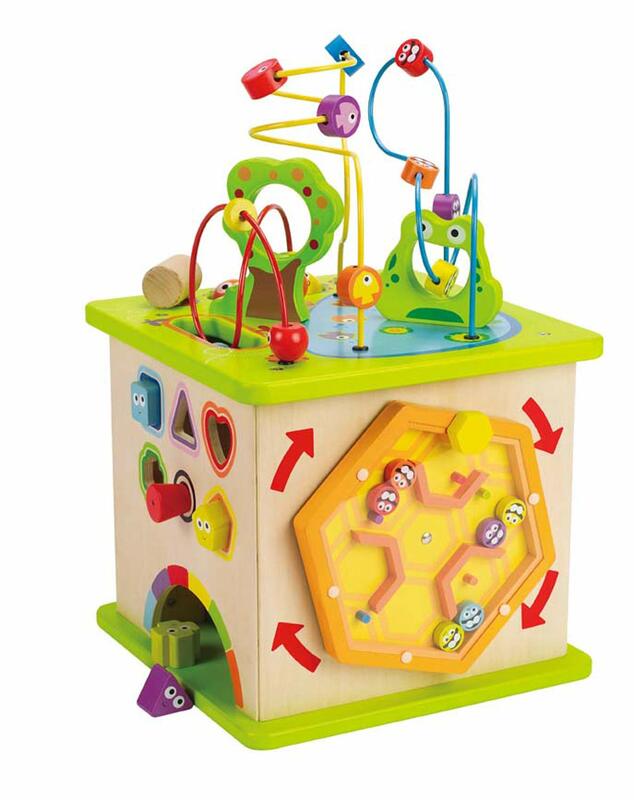 These activity cubes are very popular, and offer five sides of fun play. I would get this for babies 6 months and up, though it is great for toddlers, too. 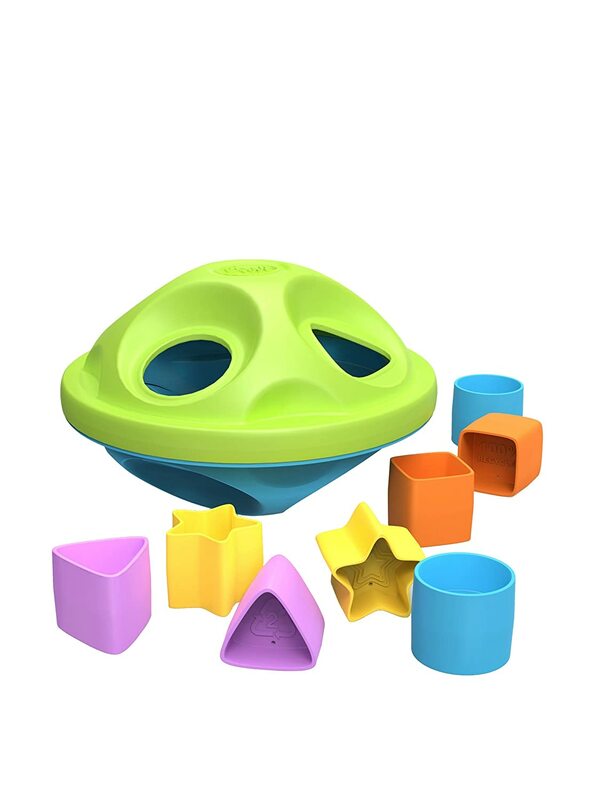 Shape sorters help babies to develop their hand-eye coordination and shape recognition. 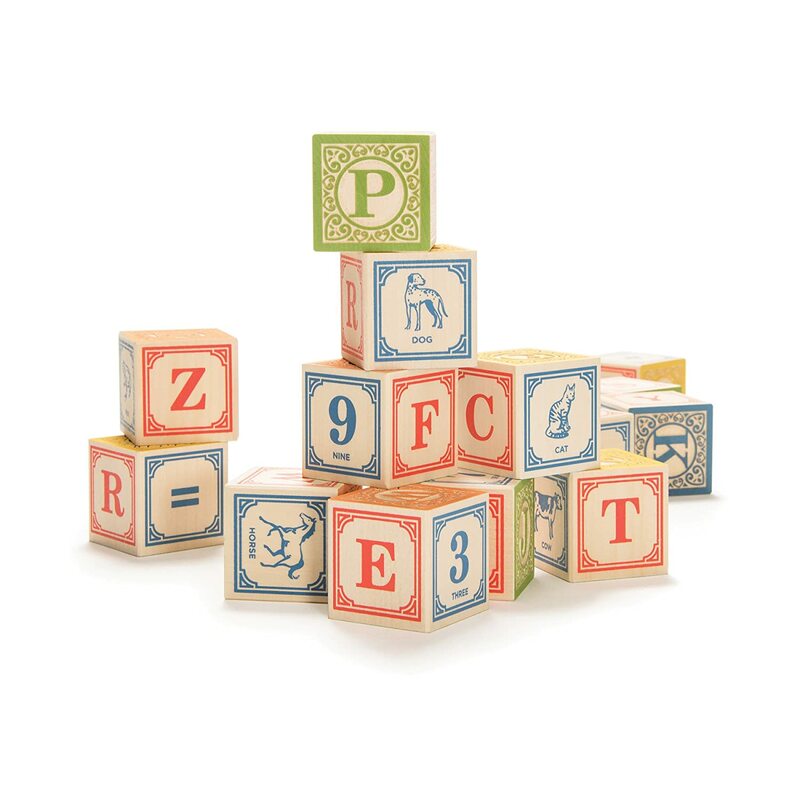 Made from birch wood and featuring toys made with organic cotton. 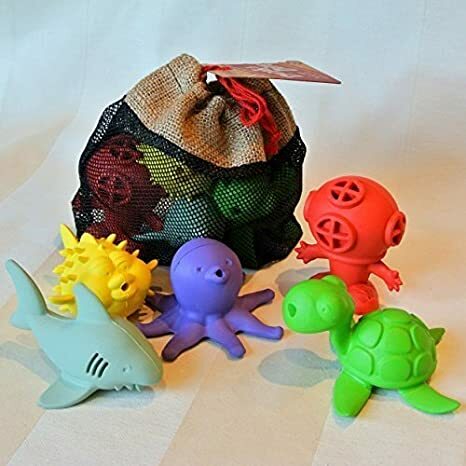 These toys also attach to a stroller or car seat, making them useful for on the go. This is a great gift for babies up to 9 months of age. 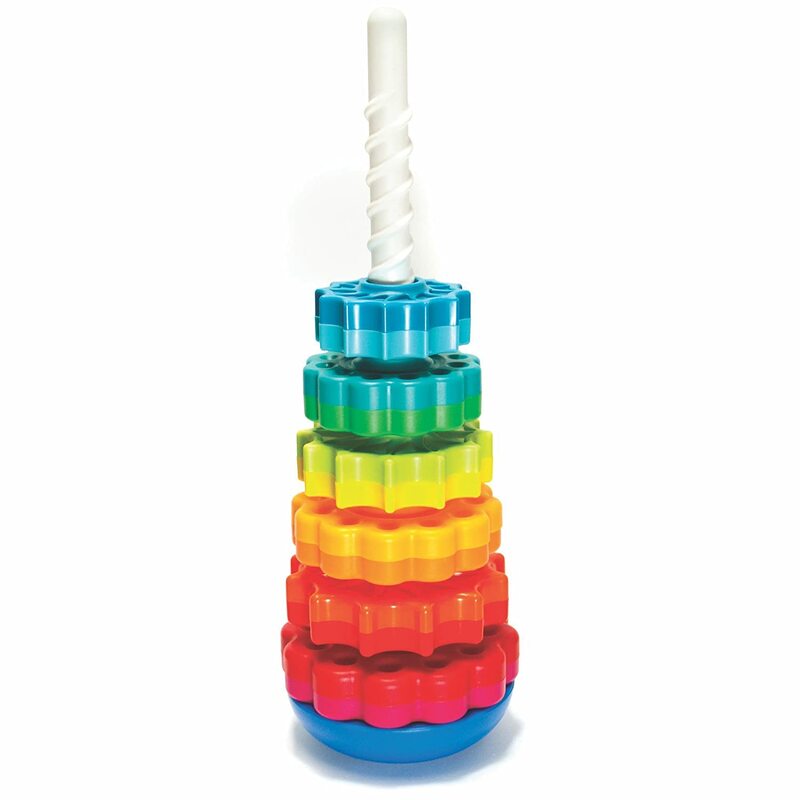 This rainbow stacking puzzle is a classic! There are so many ways to play with this, and it is fun for kids of all ages (making it a great pick for families with older siblings). This is the perfect ride on toy for babies and toddlers. It’s a huge hit in our home. My youngest really started to appreciate this toy around the 12 month mark. 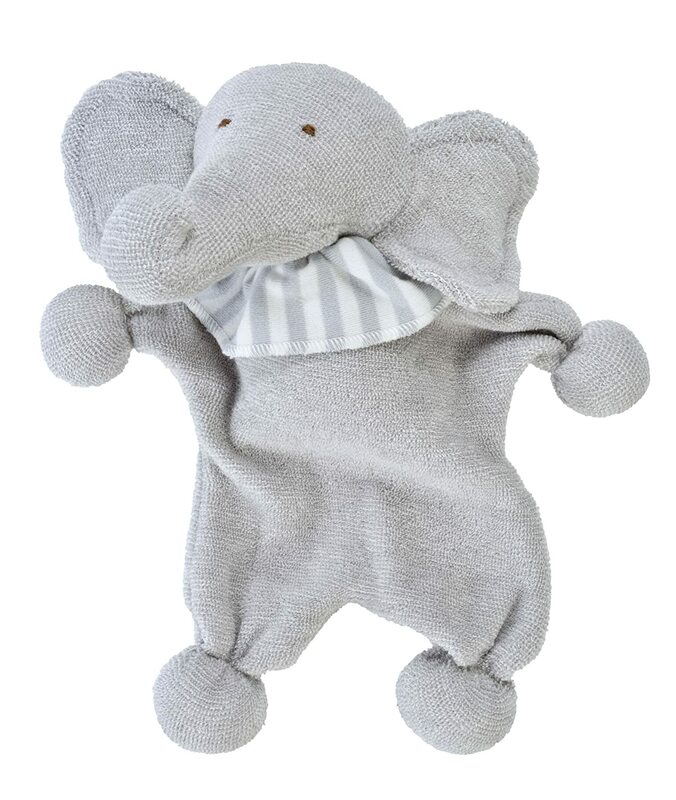 Like all of their stuffed animals, this cute Elephant is made with GOTS-certified organic cotton. 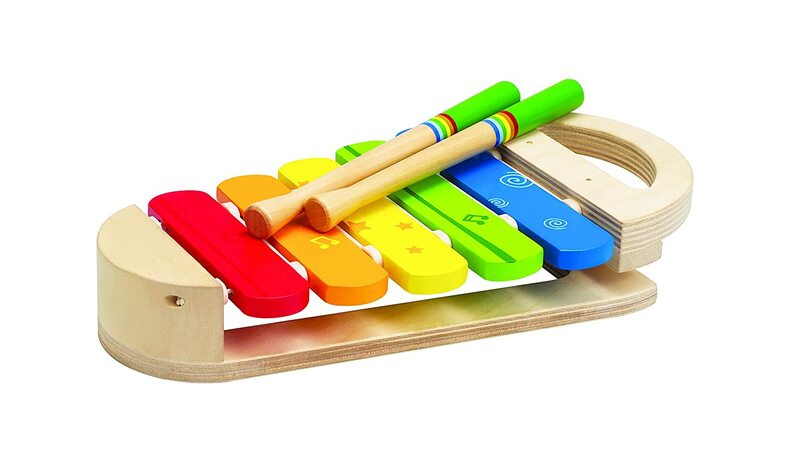 A well-crafted wooden xylophone that’s fun for babies and toddlers alike. 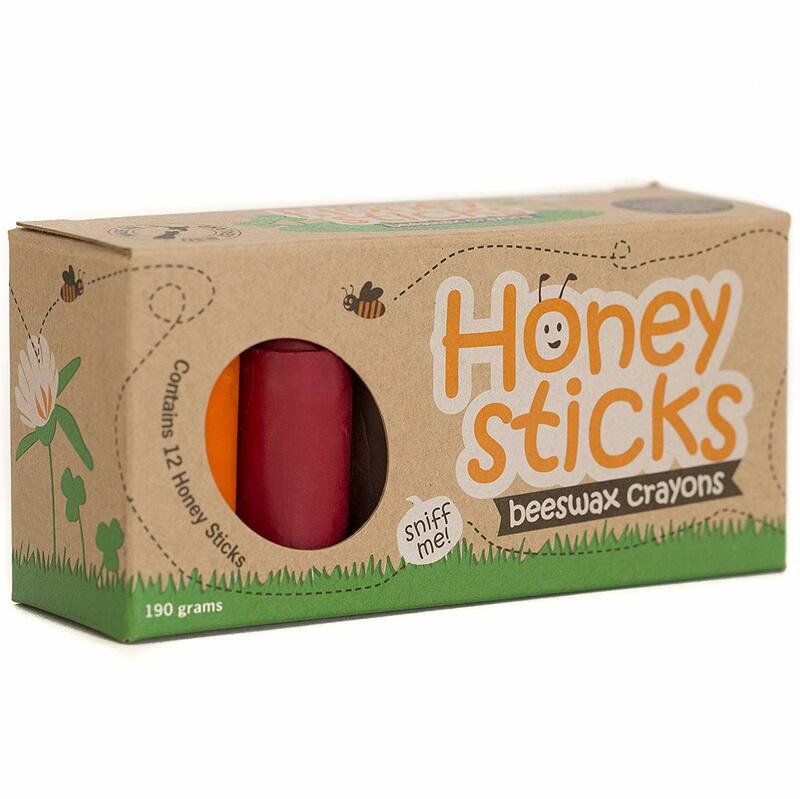 Truly non-toxic crayons that are perfect for little hands. These bears are adorable and are made with a GOTS-certified cotton outer fabric. Both of my kids have their own for bedtime cuddles. These are appropriate for any age. 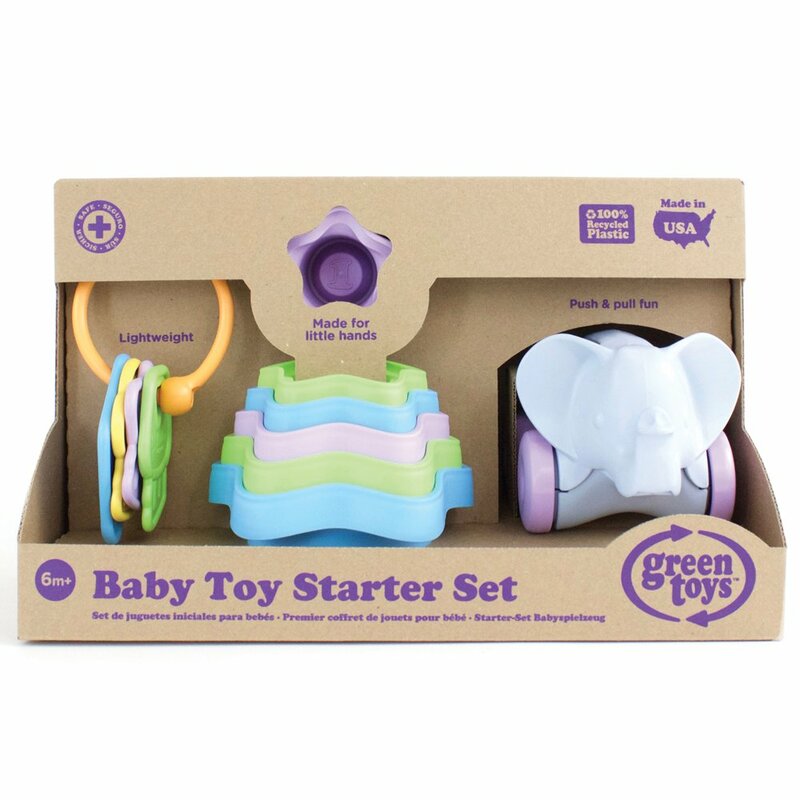 This fun baby set includes stacking cups, key rings, and an elephant toy. These are great for babies 3 months and older. 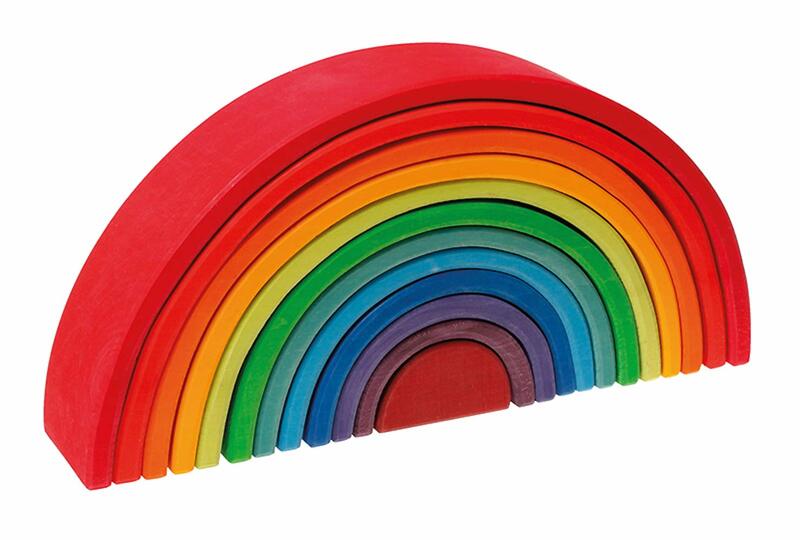 A wooden rainmaker toy that makes fascinating sounds. 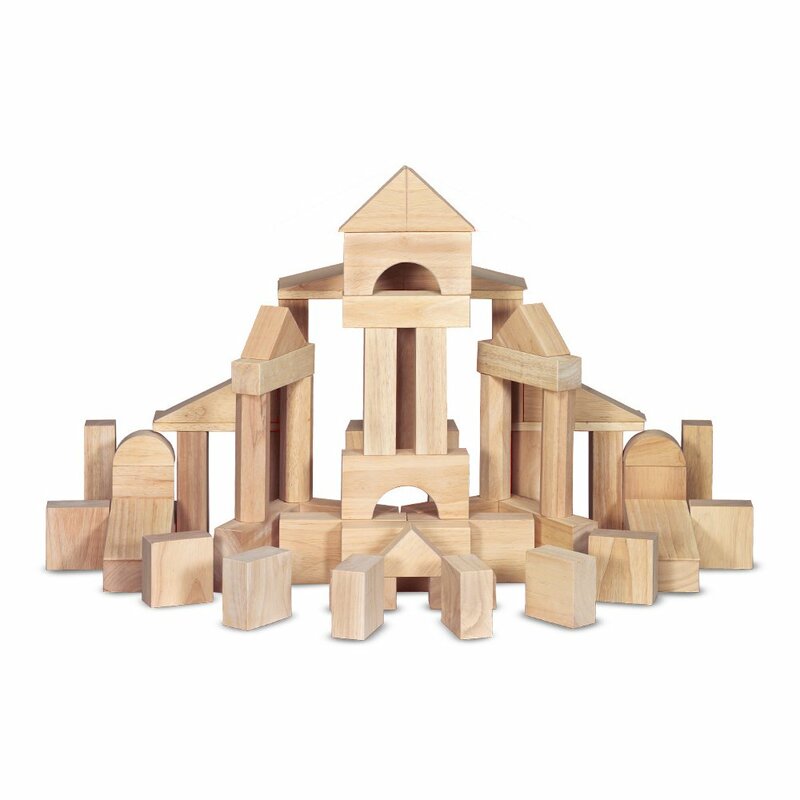 Solid wood blocks are perfect for playtime. Please note that these are large and heavy, so they would make a good gift for babies 18+ months. Babies love to mimic what they see in the home. 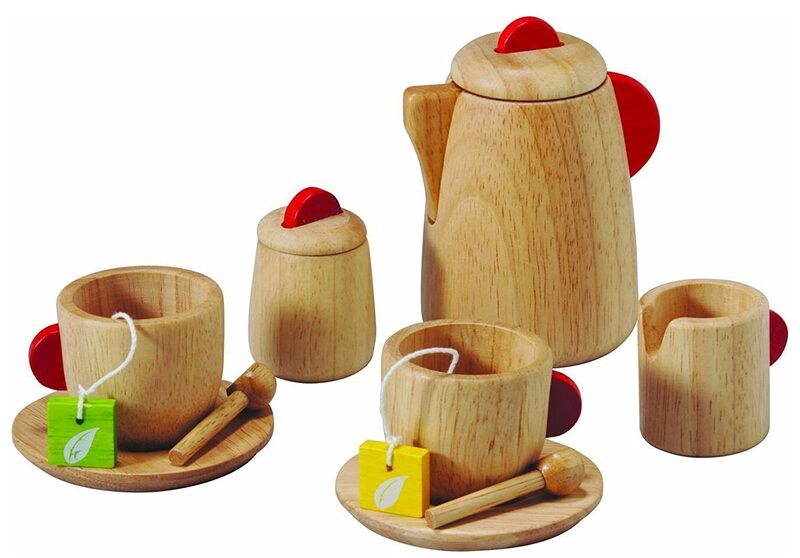 This tea set is a perfect opportunity for pretend play. 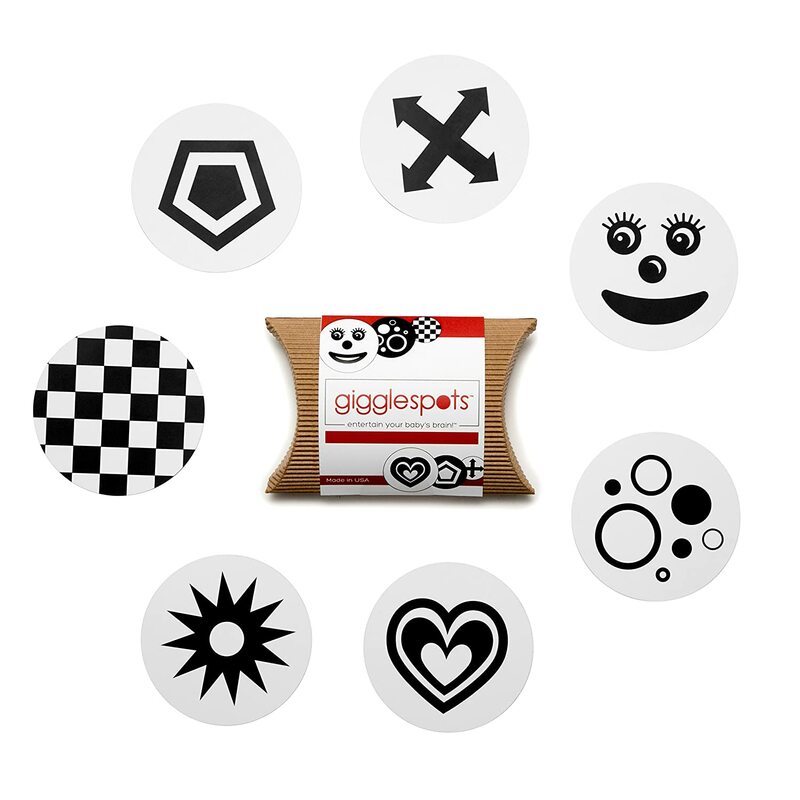 Dishwasher-safe natural rubber bath toys make a perfect gift. We have gotten a lot of use out of these, and they have held up after months of daily baths. Uncle Goose makes high quality blocks in 23 different languages and on various themes. These are a great buy! 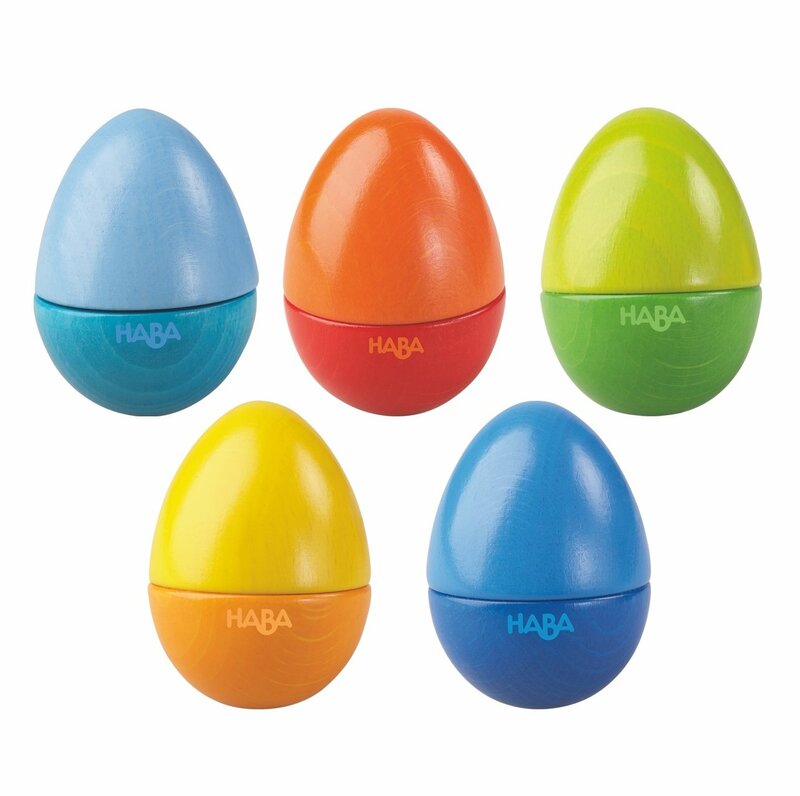 These ergonomically designed maracas are lots of fun. Have a mini jam session with your baby! 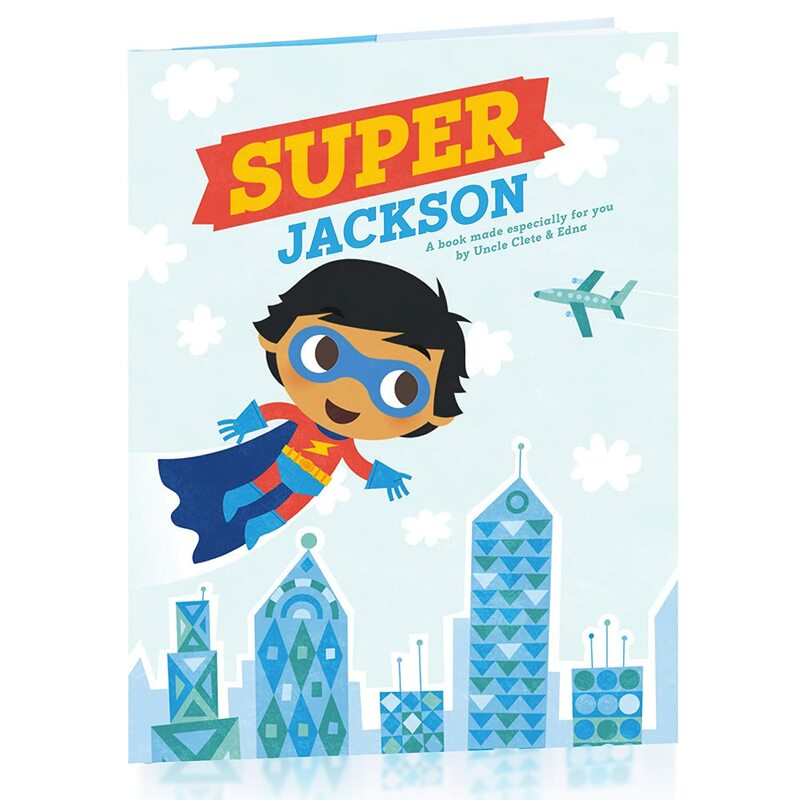 Personalize the name and appearance of the main character in this cool personalized story book. Even babies appreciate hearing their own name. 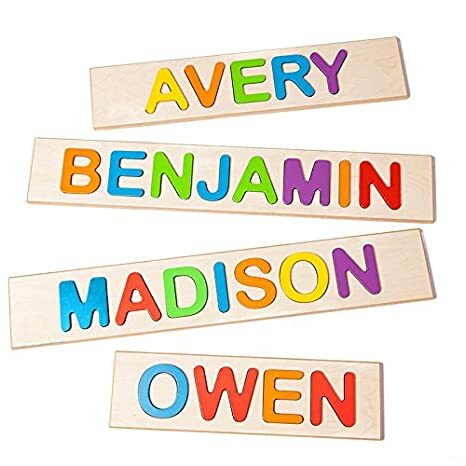 These high-quality wooden name puzzles will get lots of use over the years. And they help teach kids the letters of their name, which is helpful. 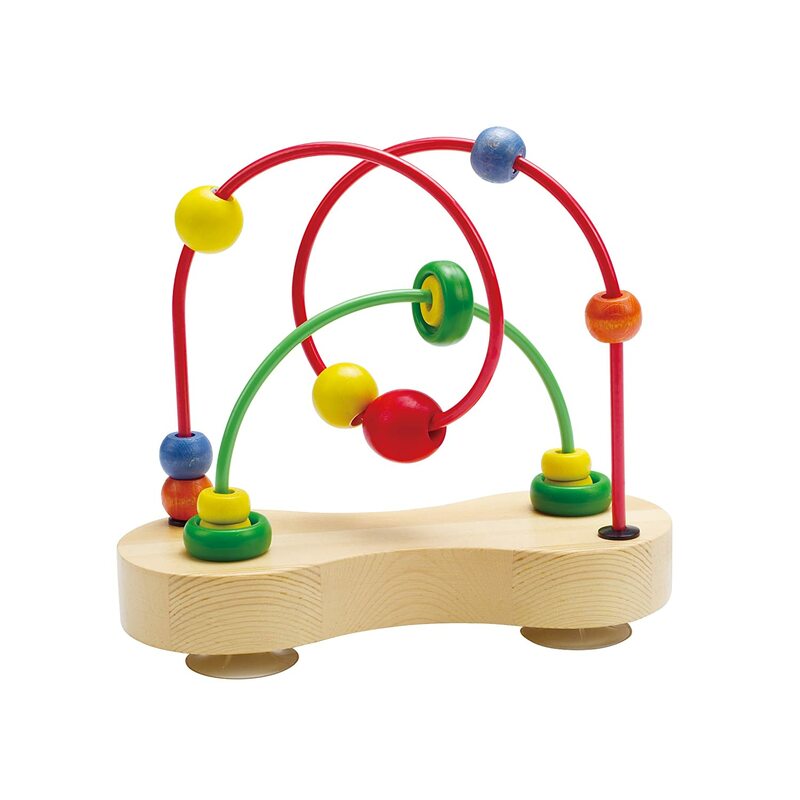 A stacking toy that helps babies 6 months and older develop their hand-eye coordination. 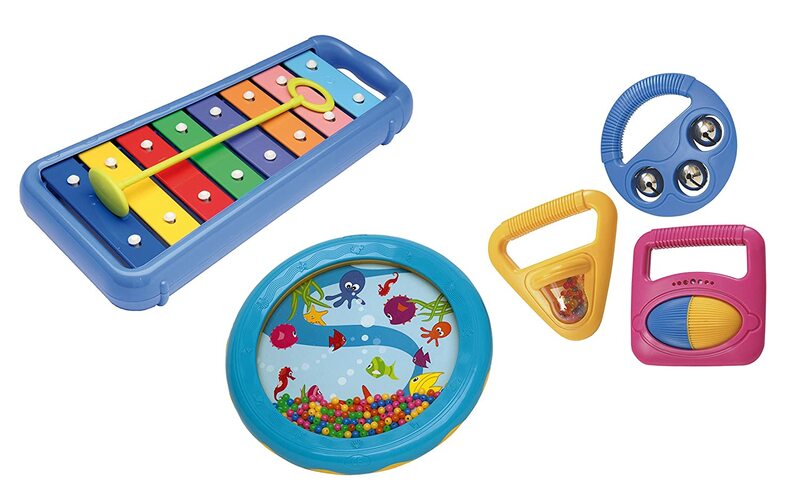 These musical toys are a huge hit in our home. 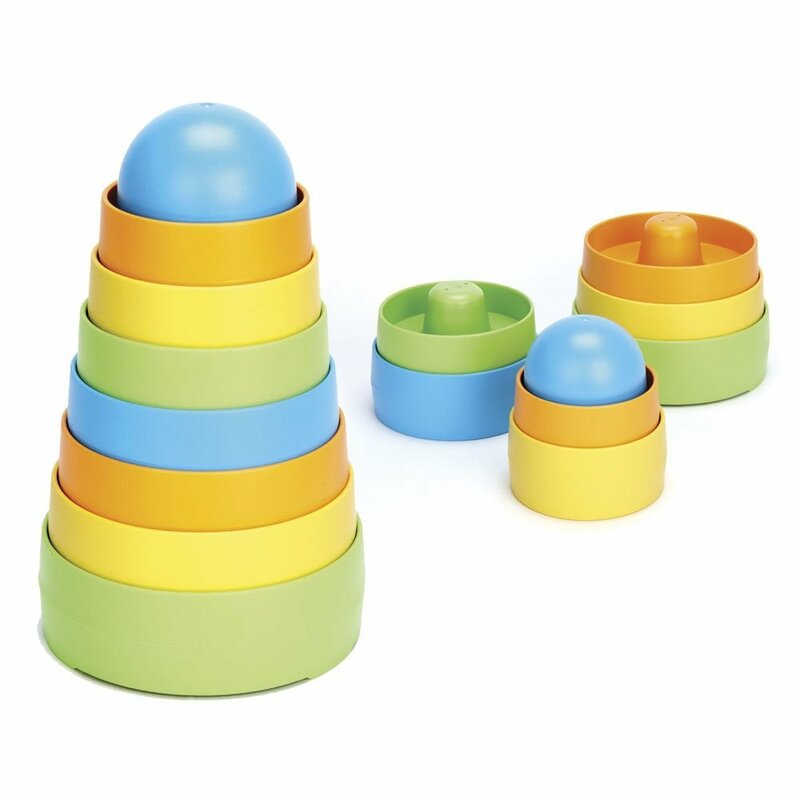 They are plastic, but they are free of BPA and phthalates. These are one of my go-to gifts for first birthdays. 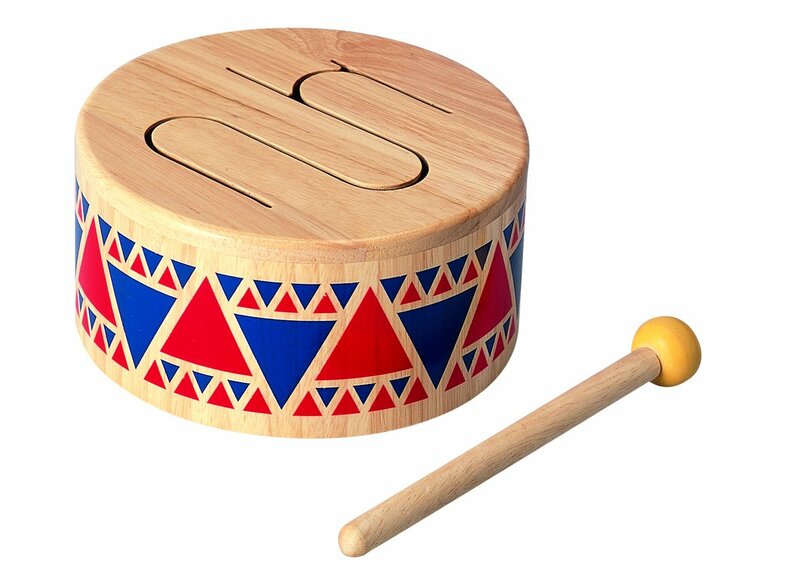 However, if you’d prefer to avoid plastic altogether, check out this wooden tambourine toy. These high contrast cards help stimulate your baby’s vision, and they are easy to take along with you in your diaper bag. These cogs are fascinating to watch as they spin around! 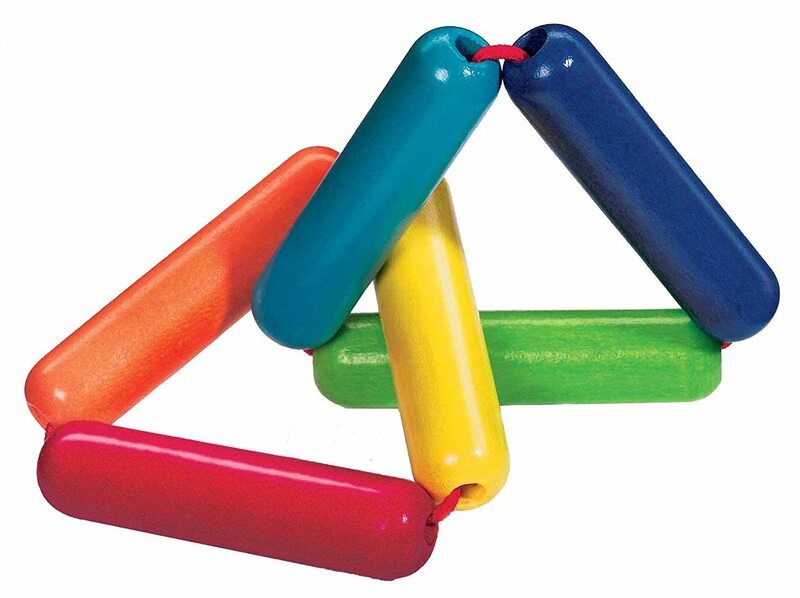 A Pikler Triangle is a climbing toy that can be used as early as 6-8 months of age. Popular among Montessori and RIE advocates, it helps babies develop confidence and gross motor skills. If you have the space for this, it makes a great gift! 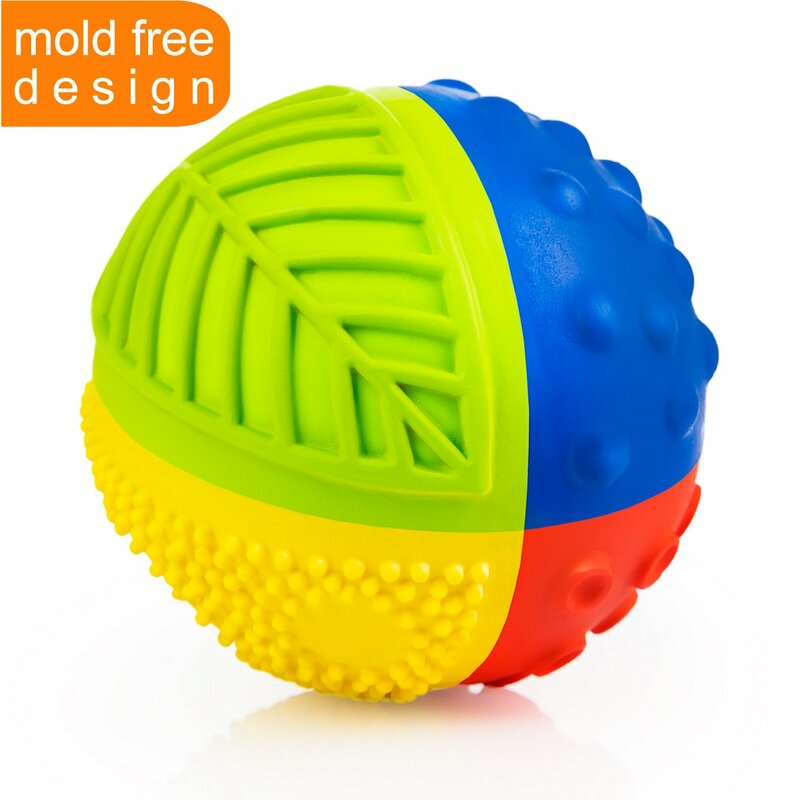 Sensory balls are great for sensory exploration, but most popular sensory balls are made from plastic. 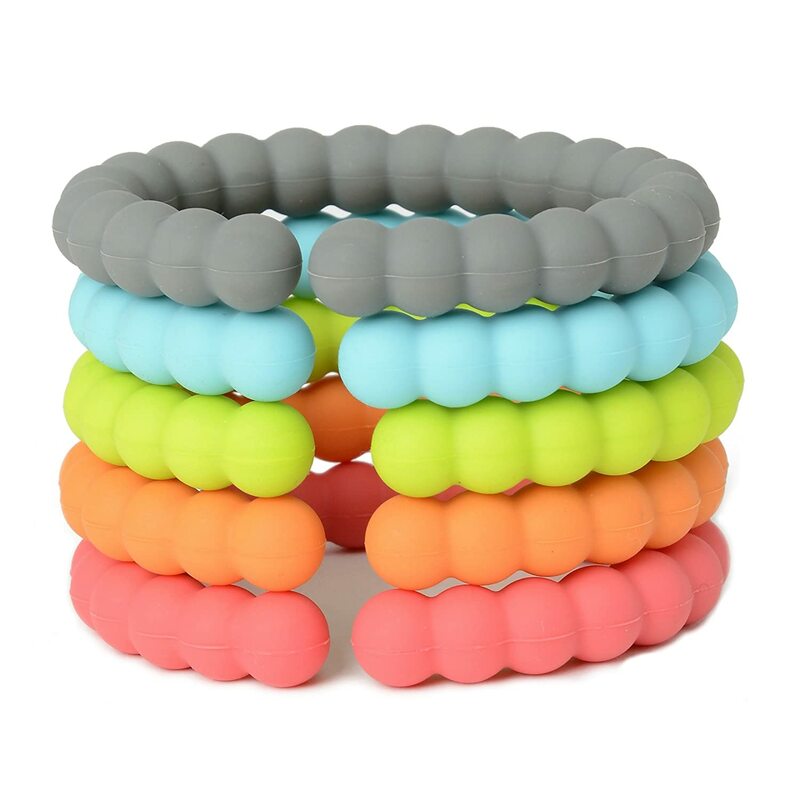 These are made from food-grade silicone, so you won’t have to worry when your baby plays with them or even chews on them. These may be a little heavy for younger babies, so you might have to use them with supervision. 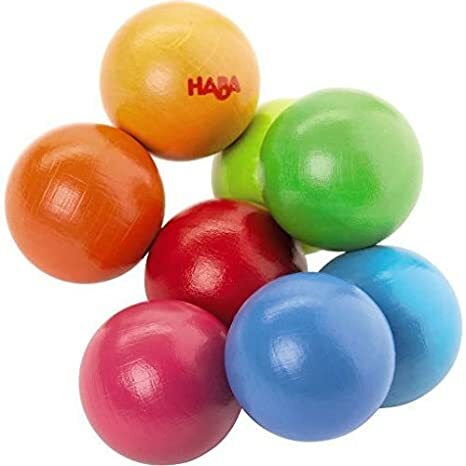 If you prefer sensory balls that are not made in China, look into these. 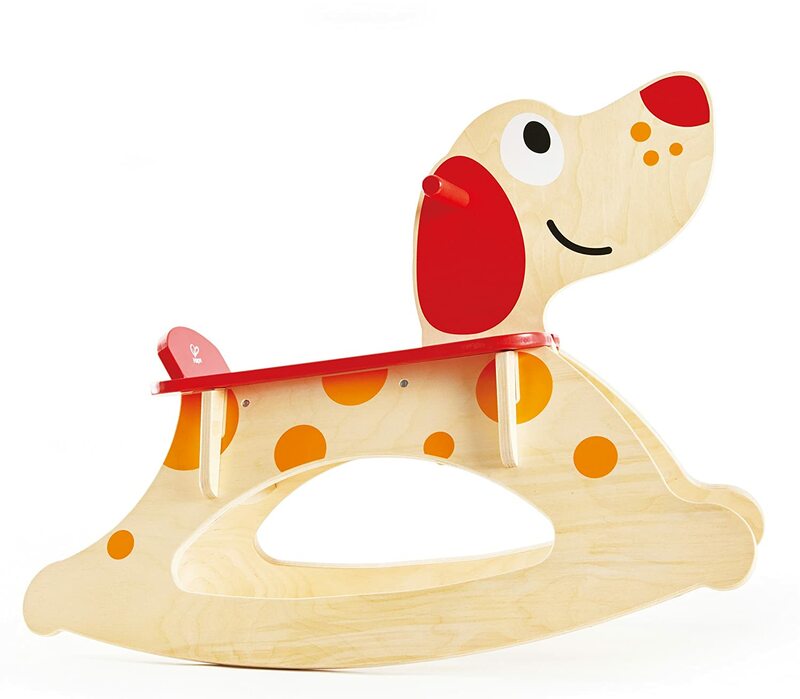 This is another favorite in our home, and it is small enough to tuck into the diaper bag for playtime on-the-go. The colors are beautiful and there’s just something so simple about it that makes it lots of fun. 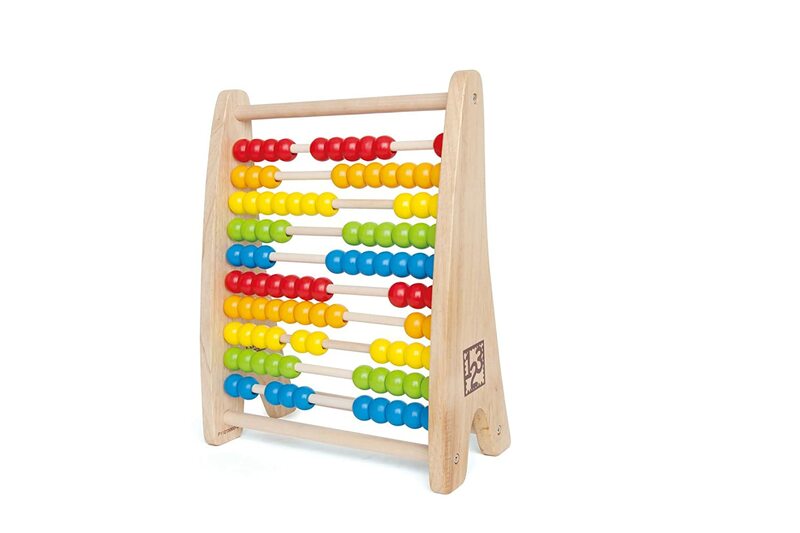 Though this will really come in handy as your baby gets closer to preschool age, I find that even babies under 18 months enjoy playing with this abacus. My kids would always play with the bead mazes at doctor’s appointments, so I finally brought one home and it has gotten lots of use. 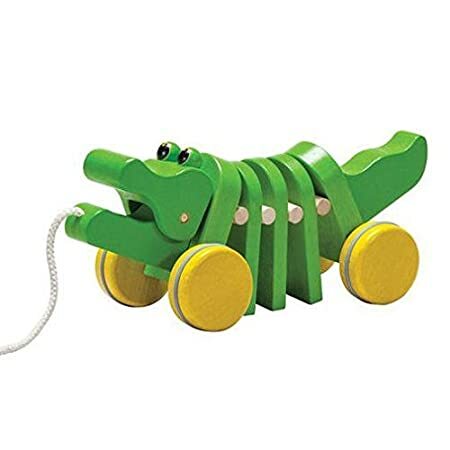 Like the walk-along puppy, these wooden pull toys make a fun gift for babies and toddlers alike. I don’t leave these within reach because of the string, but we do let the kids play with them while supervised. 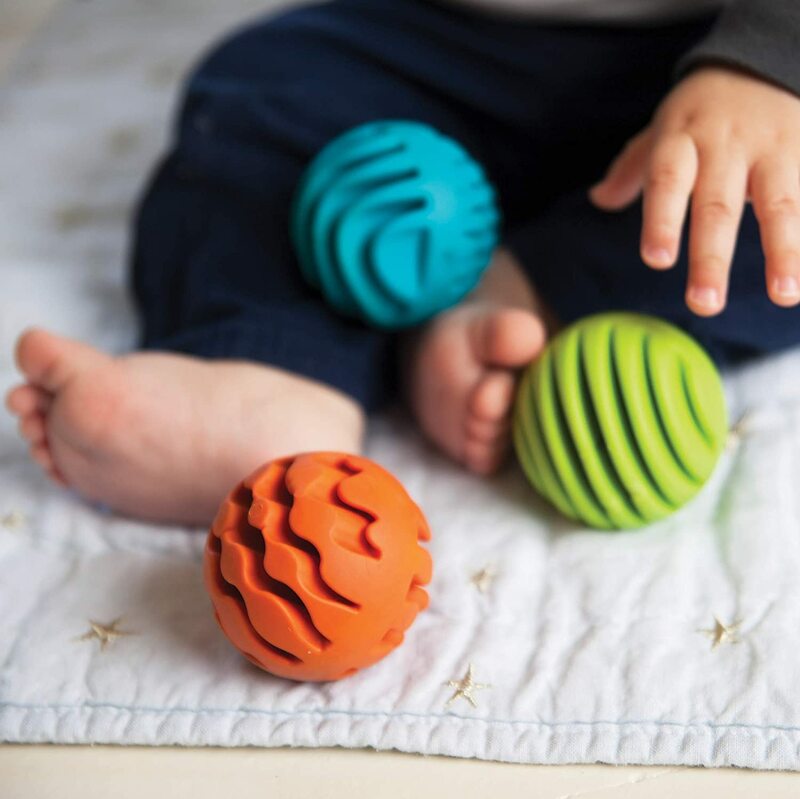 This bright and colorful 3″ sensory ball made from natural rubber makes a wonderful (and all-around safe) gift for babies. Books are always a good idea! Soft and literally indestructible, Indestructibles are safe for babies to play with. 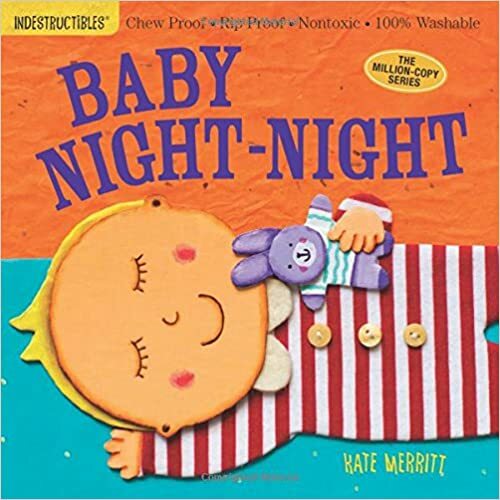 For more baby book recommendations, check out the top 25 books for your baby’s first library. 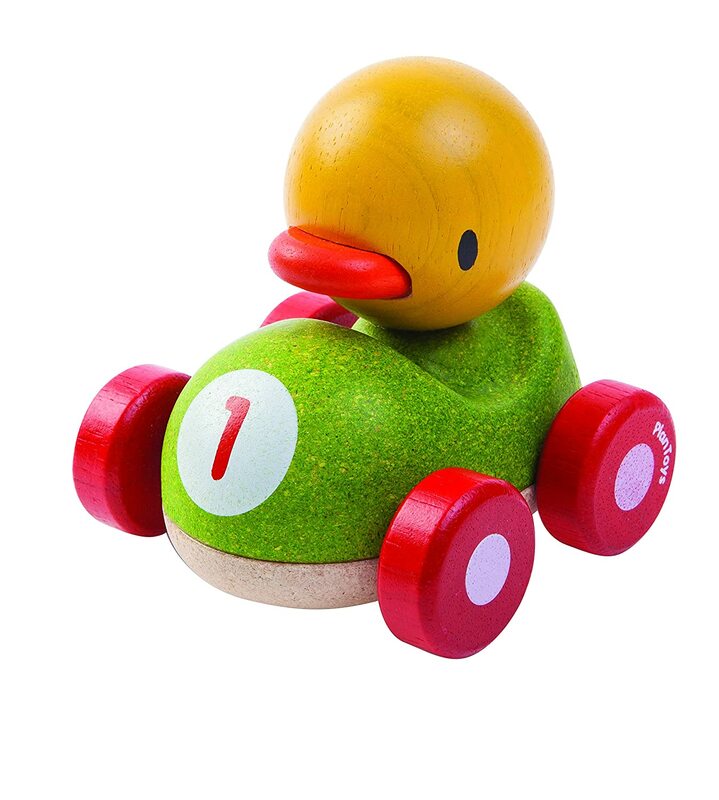 Too cute not to list, this duck racer also helps babies develop their fine motor skills. 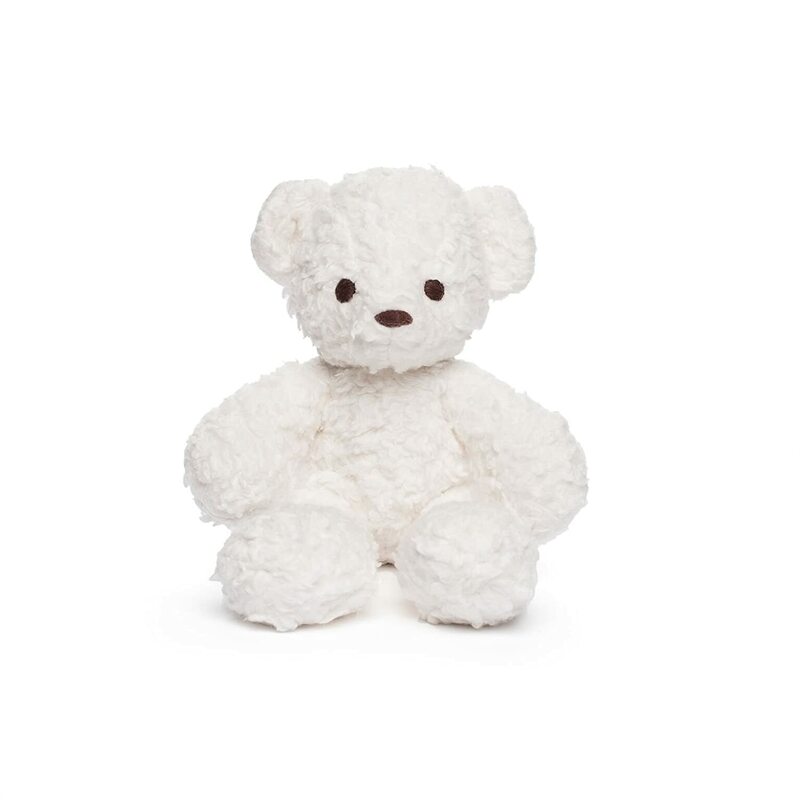 These adorable stuffed animals are made with 100% cotton fabric and filling, making them safe for babies to chew on. 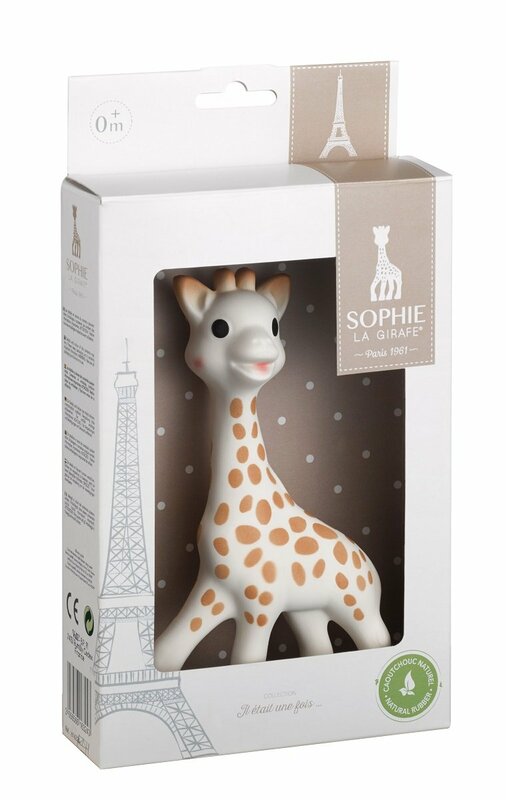 A tried and true favorite teething toy, Sophie the Giraffe also makes a great gift. 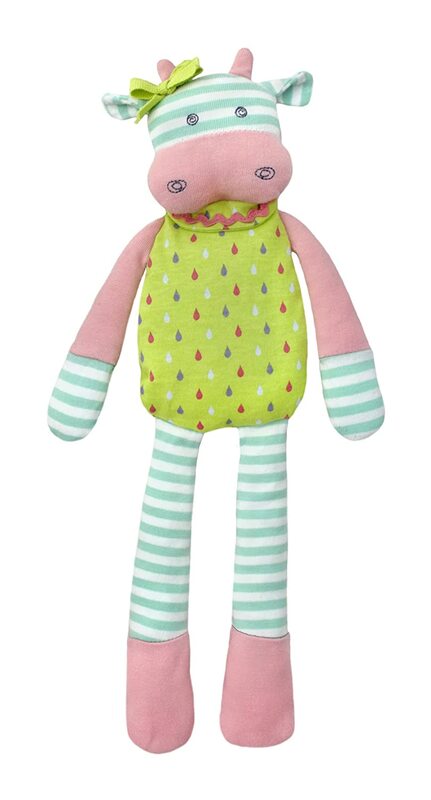 Made from natural rubber, Sophie is a safe toy (and teether) for babies of all ages. Make sure to look for her other friends, too. 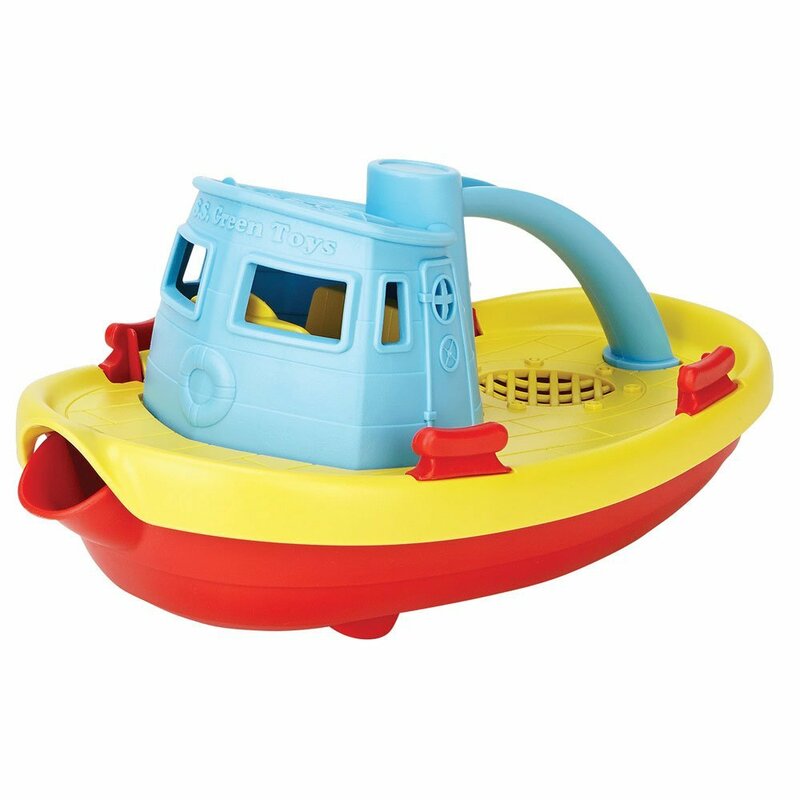 Another great classic from Green Toys, this tug boat makes a great gift for babies 6+ months. 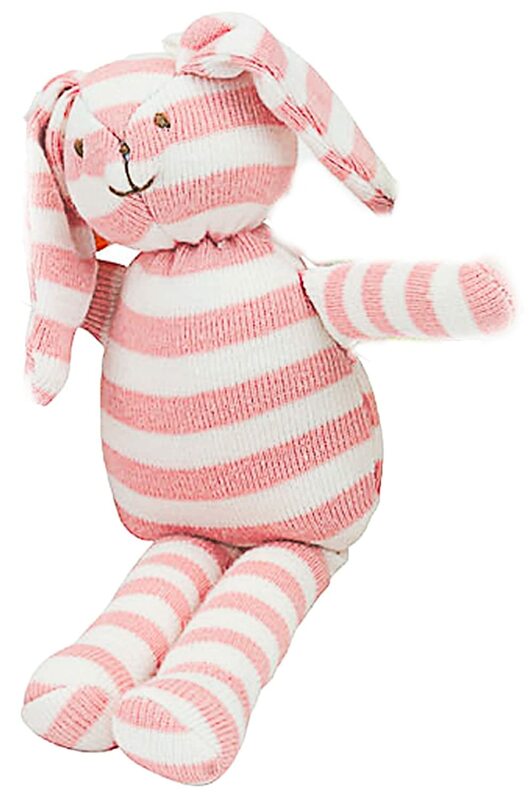 An adorable plush toy perfect for babies of any age, Organic Farm Buddies are handmade in China. They are 14″ and made with 100% organic cotton and feature a corn fiber filling. They also make an adorable matching blankie. 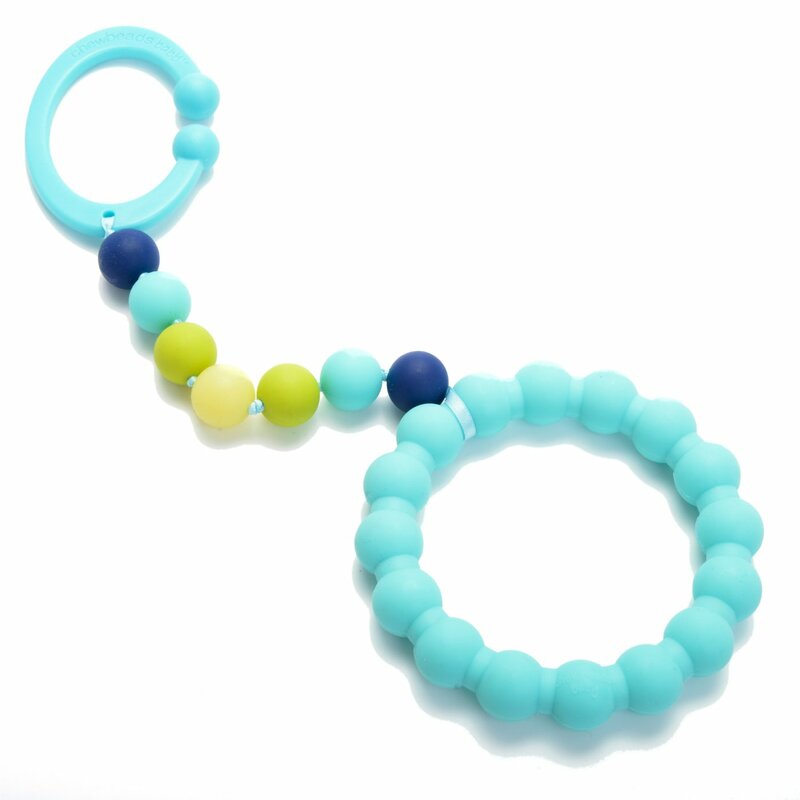 These teething beads are genius! I wish I had known about these when my boys were teething. They make a great gift for babies 3 months and older, though a newborn would also eventually get plenty of use out of them. 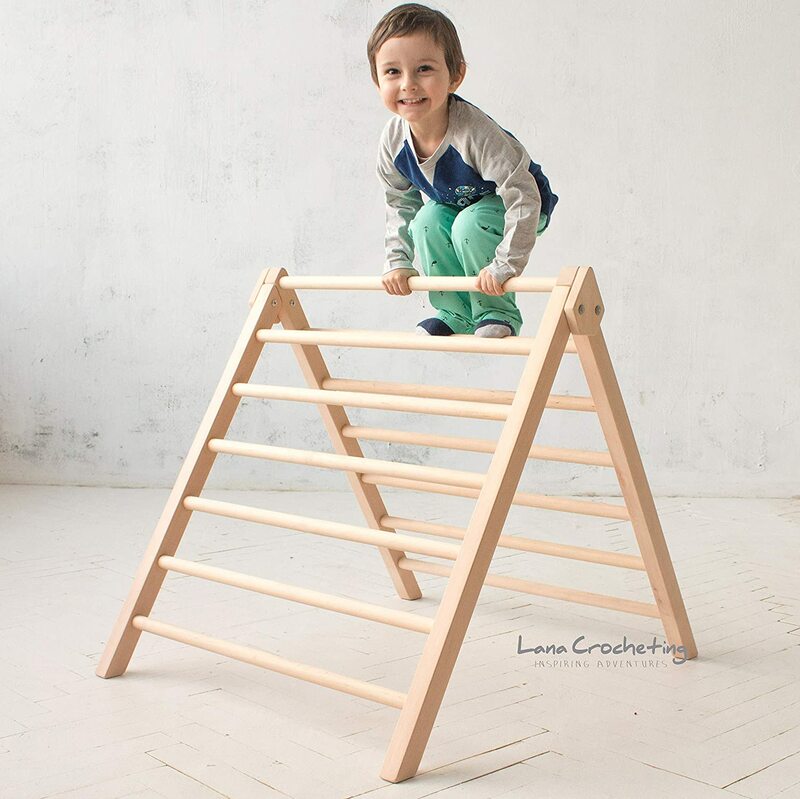 Another non-toxic play gym for you to consider, the Lovevery gym grows with your baby. 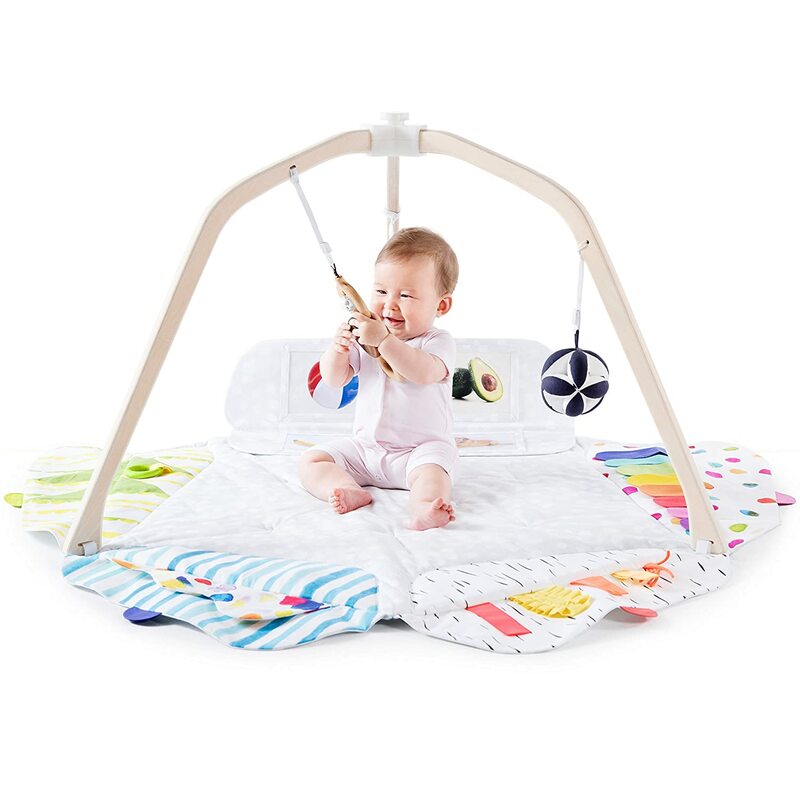 It is great for tummy time in the beginning and then is great for baby’s independent play time as she grows. It comes with a free booklet with playtime ideas for babies, and the detachable toys are made from cotton and/or silicone. The mat is made from polyester, but you can always cover it with a cotton blanket or just use your own non-toxic playmat. Want a Lovevery promo code? Take $10 off your order by clicking here. These links connect and can attach to a stroller, car seat, or high chair. They’re a safer alternative to popular plastic links and would be great for most babies beginning at 3 months or so. I hope you found these non-toxic gift ideas for babies useful! It really is worth it to buy non-toxic toys whenever possible so that you can avoid BPA, PVC, phthalates, and other harmful chemicals. This goes double when your baby is putting everything in their mouth. Whether you’re shopping for your baby’s first birthday or for holiday gifts, I hope you found a few great toys on this list of gift ideas for babies. For more non-toxic gift inspiration, check out my list of safer toy brands.